One of the Gods of Indian Trimūrti (three forms) Brahmā, Viṣṇu. Śiva. 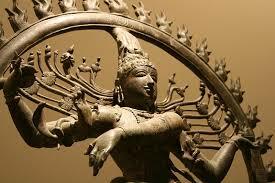 It is considered as the God of Yoga and Danse. He is often represented in the symbolic form of the liṅgaṃ Śiva or in deep meditation or still dancing “Naṭarāja”.